Islamic bigots under the banner of International Khatme Nabuyat Movement (IKNM) yesterday besieged the Ahmadiyya mosque at Chawkbazar in the city after the Juma prayers. 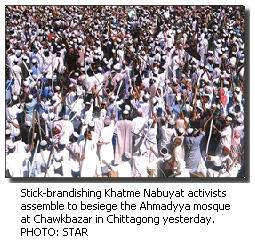 Hundreds of firebrand demonstrators wielding bamboo sticks demanded declaration of the Ahmadiyya sect as non-Muslim. The besiege programme, however, ended peacefully with the intervention of police. The IKNM members left the mosque after erecting a signboard that reads: Place of worship for the Ahmadiyyas. Muslims are advised not to take it as a mosque to be deceived. The IKNM leaders threatened to besiege other installations of the Ahmadiyyas by phases. Over a dozen platoons of police, mostly in riot gear, cordoned off the mosque from yesterday morning to avert any untoward situation. Sources alleged police made a deal with the IKNM leaders to maintain peace. The demonstrators in caps and coloured ribbon around their heads marched from Jamiatul Falah mosque premises to the Ahmadiyya mosque at around 4:00pm. They staged a sit-in and the leaders spoke from a make-shift dais, as police barred them from reaching the mosque. The central leader of IKNM Mohammad Hasan Mamtaji, Nayeb-e-Amir Mufti Nur Hossain Nurani, among others, addressed the sit-in.